What’s “Balance, Busyness and Not Doing It All” about? Balance, Busyness and Not Doing It All is a resource from a retreat for moms on the same subject title. After doing the retreat, attendees ask, “Where’s the book, I want to share it with others! I’m excited to share an inspirational, practical and authentic resource for moms who feel trapped by busyness. How does this book differ from others of its genre? There are a lot of books for moms – devotionals, ebooks on housekeeping ideas, and ways to break away from the Supermom image. While “Balance” touches on those subjects, it also equips moms to identify their strengths, face their weaknesses, and gives them courage to let things go. The material grows from personal experience I’ve had both as a stay-at-home mom and a working mom and how I changed careers because my life was too busy and stress-filled. There aren’t a lot of books that honestly deal with the struggles of both SAHM and working moms. As I speak to moms throughout the country, I find they’re exhausted and trapped in busyness and pressures of conformity for them and their kids. I write from experience as a mom and counselor working with kids and families. 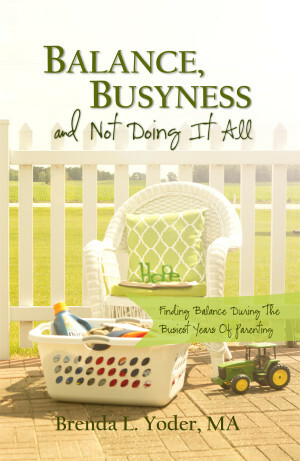 The book addresses real ways to get out of the busyness trap. I’m living it. I hear moms say they don’t know how to de-stress, be less busy, lighten their workload, or spend time with God. “Balance” gives practical solutions for each of these topics. I want the reader to have tools to use the minute they put the book down. The book will first be available on August 29, from 10-5, at The Glow Christian Bookstore in Shipshewana, IN. It will be available for pre-orders on the website from September 1-4, and beginning September 5 will be available here, at Amazon, and at Aunt Millie’s Cafe and The Old Wolfe Barn in Shipshewana, IN. Watch upcoming promotions from August 29-September 12 on Instagram and Facebook!